Capital of Monroe county, and the third city in size in the state of New York. According to the latest census (1900) it has 162,608 inhabitants, among whom, it is estimated, the Jews number about 5,000. Although a few Jews lived in Rochester as early as 1840, the history of the Jewish community does not begin until 1848. In that year twelve young men, all natives of Germany, most of them still unmarried, united to hold services on the high festivals, and for this purpose met at the residence of one of them, at the corner of Clinton street and Clinton place. Their names were Joseph Wile, Samuel Marks, Joseph Katz, Gabriel Wile, Meyer Rothschild, Henry Levi, Jacob Altman, Joseph Altman, A. Adler, Elias Wolff, Abram Weinberg, and Jacob Gans. On Oct. 8, 1848, the day after the Day of Atonement, they met at the same place and formed the Congregation Berith Kodesh. For six months services were held at the same residence, until in April, 1849, a hall was rented for the purpose of divine worship. This hall was situated on the third floor of 2 Front street, corner of Main street. In the year 1856 a building formerly a Baptist church was purchased on St. Paul street. This building was adapted to the needs of the congregation and used until the year 1894. In the meantime the congregation had grown very rapidly, and had long felt the want of a more spacious edifice. Accordingly in 1893 the present magnificent temple was erected, and was dedicated June 1, 1894; it was designed by Leon Stern, a member of the congregation, and built on the corner of Gibbs and Grove streets, at a cost of $130,000. It is one of the finest of the buildings devoted to public worship in the city. 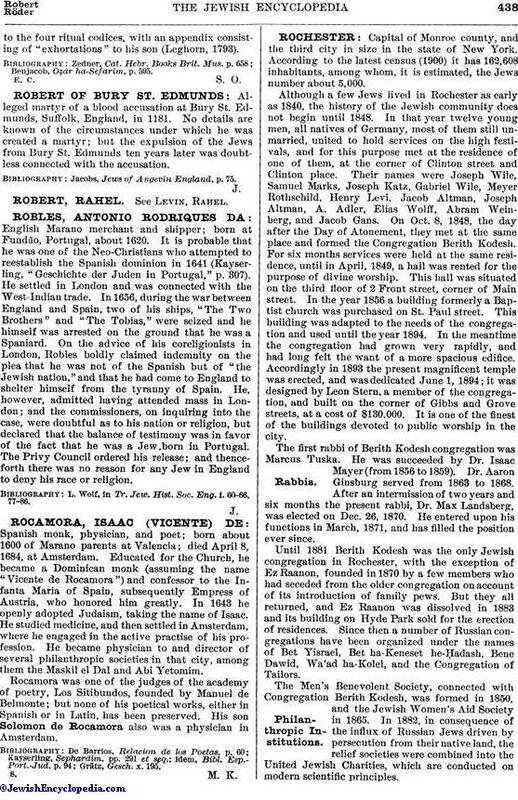 The first rabbi of Berith Kodesh congregation was Marcus Tuska. He was succeeded by Dr. Isaac Mayer (from 1856 to 1859). Dr. Aaron Ginsburg served from 1863 to 1868. After an intermission of two years and six months the present rabbi, Dr. Max Landsberg, was elected on Dec. 26, 1870. He entered upon his functions in March, 1871, and has filled the position ever since. Until 1881 Berith Kodesh was the only Jewish congregation in Rochester, with the exception of Ez Raanon, founded in 1870 by a few members who had seceded from the older congregation on account of its introduction of family pews. But they all returned, and Ez Raanon was dissolved in 1883 and its building on Hyde Park sold for the erection of residences. Since then a number of Russian congregations have been organized under the names of Bet Yisrael, Bet ha-Keneset he-Ḥadash, Bene Dawid, Wa'ad ha-Kolel, and the Congregation of Tailors. The Men's Benevolent Society, connected with Congregation Berith Kodesh, was formed in 1850, and the Jewish Women's Aid Society in 1865. 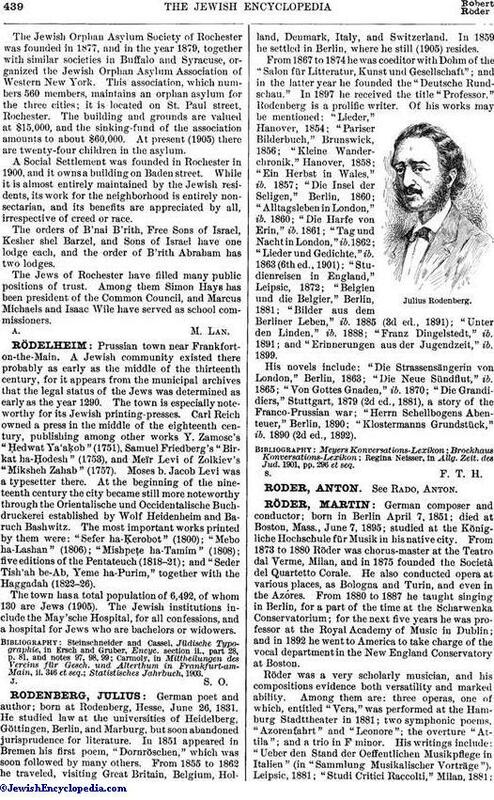 In 1882, in consequence of the influx of Russian Jews driven by persecution from their native land, the relief societies were combined into the United Jewish Charities, which are conducted on modern scientific principles. The Jewish Orphan Asylum Society of Rochester was founded in 1877, and in the year 1879, together with similar societies in Buffalo and Syracuse, organized the Jewish Orphan Asylum Association of Western New York. This association, which numbers 560 members, maintains an orphan asylum for the three cities; it is located on St. Paul street, Rochester. The building and grounds are valued at $15,000, and the sinking-fund of the association amounts to about $60,000. At present (1905) there are twenty-four children in the asylum. A Social Settlement was founded in Rochester in 1900, and it owns a building on Baden street. While it is almost entirely maintained by the Jewish residents, its work for the neighborhood is entirely nonsectarian, and its benefits are appreciated by all, irrespective of creed or race. The orders of B'nai B'rith, Free Sons of Israel, Kesher shel Barzel, and Sons of Israel have one lodge each, and the order of B'rith Abraham has two lodges. The Jews of Rochester have filled many public positions of trust. Among them Simon Hays has been president of the Common Council, and Marcus Michaels and Isaac Wile have served as school commissioners.